Manuel Valls, a candidate to be mayor of Barcelona, attacked a Catalan literature award winner on Sunday evening after he criticised the imprisonment of pro-independence political leaders in his acceptance speech. The former French prime minister was part of the public in the ceremony of the Josep Pla prize and expressed his anger on Twitter. ‘Tonight I have felt sadness, anger and shame after this speech and this demagogy … Poor Josep Pla … Enough!’ he wrote. Pla was one of the most renowned Catalan writers in the 20th century. 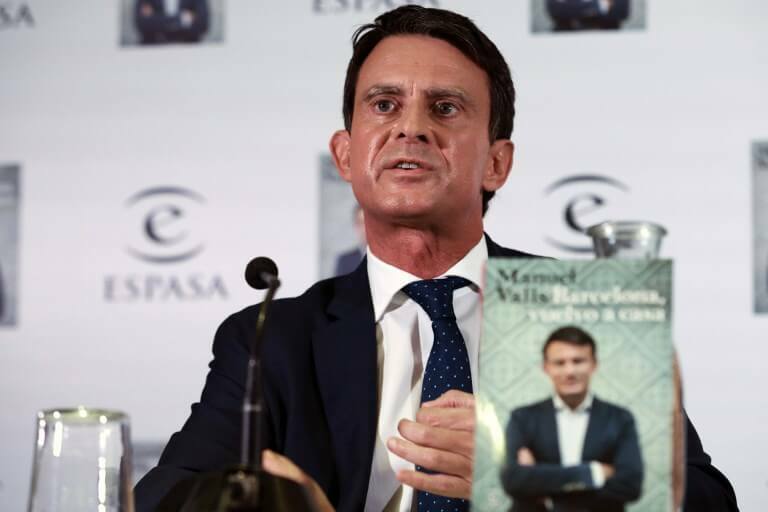 According to some of the guests in the ceremony, Valls also showed his disagreement with the prize winner, Marc Artigau, during the event at the table where he was sitting. ‘He started to shout during the dinner, we did not know who was shouting and what they were saying, but the ones there thought someone had drunk too much,’ said journalist and historian Enric Calpena. The famous writer Jordi Cabré also said Valls ‘performed a disgraceful show not worth of being a candidate for mayor.’ He also claimed that the former French official asked the Spanish delegate in Catalonia why she allowed such a speech. The current mayor of Barcelona, Ada Colau, reacted to Valls’ attitude by calling it ‘histrionic and out of place’. ‘I was left wondering whether it all was a performance calculated to be the news of the dinner,’ said Colau. Another candidate for the 26 May local election, Ernest Maragall, Valls made ‘a frontal attack to the freedom of speech’. The winner of the Josep Pla prize, Marc Artigau, said in his acceptance speech that he feels an ‘unavoidable sadness and anger at living in a country with political prisoners and where the legitimate Catalan government is in exile’. ‘In some years, when these days and years are remembered, we will feel a big shame at everything what is happening,’ he also said.